You see, I grew up in Charleston, South Carolina, the Holy City of the South, a city that defines itself by its plethora of church steeples and deep-rooted connection to American religious history. Truthfully, Charleston’s moniker refers not only to the churches on every corner, but the diversity of faiths and congregations found within the city limits. But growing up in Charleston, I was often the only Jewish person in my classes and left to explain my religious background and my beliefs day after day. Growing up Jewish in Charleston meant feeling like I was different than everyone else around me. Unlike my friends and neighbors, I had no Christmas tree, no Easter egg hunt, and no Santa Claus. Sure, I got to miss school for Rosh Hashanah and Yom Kippur (our two High Holy Days, one of which is known as the Day of Atonement and is a day on which many people fast)… but try explaining that to your friends in Kindergarten. The older I became, the more I realized that my Jewish upbringing wasn’t filled with reminders of what I didn’t have, but the beautiful unique experiences that being Jewish in the South gave me. After all, where else can you experience a guitar-led Shabbat service on the beach? Where else is it not only appropriate, but encouraged, to have a plate of fried green tomatoes next to the Hanukkah latkes? But above all, being Jewish in the South encouraged me to find my voice and continuously define and redefine my cultural and personal identities. Many people, upon discovering my Jewishness, would tell me that they had never met a Jewish person before. They would ask questions – both ones I felt comfortable answering and ones that were based in misconceptions. They would share their assumptions and experiences, assuming that I, as a Jew, could give them a complete detailed history of the intricacies of Judaism throughout the world. My Southern roots inform many facets of my identity, though, not just my religion. I feel that living here has made me a storyteller, if only by circumstance if not by choice. There are stereotypes about the South: that it is harsh and unforgiving to those who do not meet its expectations, that behind the welcoming hospitality and warm smile is something far more sinister and exclusionary. For some, these stereotypes are all too real. Whether for reasons related to race, class, sexual orientation, or gender identity, the South is not always a shining beacon of hospitable energy. While my Jewishness is something I’ve come to proudly and publicly celebrate here, my queerness is something I still struggle to embrace in a similar way. Unlike religion, gender was not something my community openly talked about. For the longest time, my nonbinary identity felt like an unspoken burden that I could only share with a select group of friends. Nobody said it aloud, but it was true: speaking about my ‘otherness’ by religion made me interesting and cultured but speaking about my ‘otherness’ by gender made me sensitive and overly political. I learned to step back from sharing my personal experiences as a nonbinary person. That is, until I found Transilient. The interview-based project does something that, until recently, I could not: it tells trans stories. My identity, up until the past year or so, had been defined by its privacy. It had been something that I wasn’t ashamed of, but did not know how to claim as my own. My queerness, I realized upon the discovery of Transilient, was something I defined by what I didn’t have, rather than the rich aspect of my identity that it truly was. As I read through the stories of other transgender and gender non-conforming people, it occurred to me. Rarely, if ever, had I read about a member of my community in such an open, honest, and ordinary way. These were not the coming out stories that we are so often bombarded with. These were the stories of people’s lives – their jobs, their aspirations, their successes. These were stories that gave people voices, encouraging them to make themselves visible and known. Through following Transilient’s work, I have charged myself to reexamine the intersection of my gender identity and my life in the South. 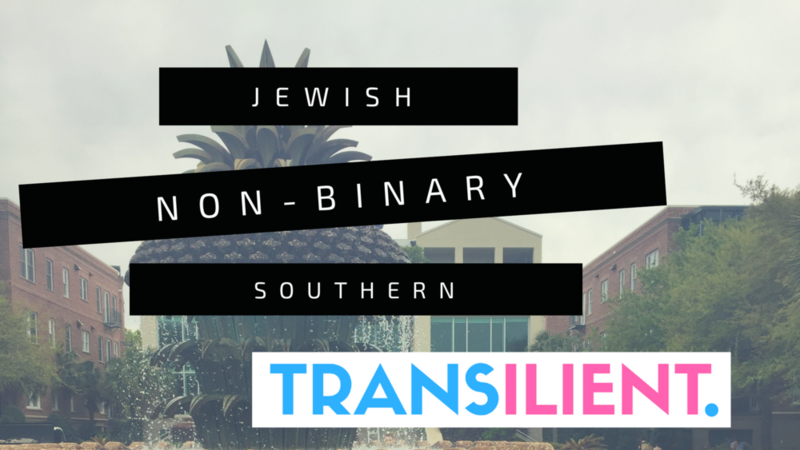 Like my Jewishness, it has taken time to celebrate my nonbinary label and the ‘otherness’ that comes with it in a place like Charleston, South Carolina or like Jackson, Mississippi. Articulating my identity, at times, is difficult. People often ask me questions based in curiosity as well as in misconceptions. But above all, my multifaceted identity has transformed me into a storyteller and a truth-seeker – two more descriptors that I am finally ecstatic to openly call my own.